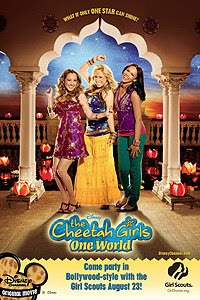 Disney and Girl Scouts got together and hosted parties all over to celebrate the premiere weekend of Cheetah Girls: One World. It was to show diversity, community service and friendship to the girls. 75 girls attended our event at Lamppost Pizza and they enjoyed pizza and cake, took a quiz, learned how to wrap a Sari, danced and won some prizes. My daughter, Sheridan, won a Cheetah Girl magnet set for her correct answer on the quiz and another girl from our troop, Sophie, won a beautiful Sari!